We sailed overnight, a full day and overnight again, not quite totally without incident. We found what looked like a nice abandoned pier around 90th Street to tie on to and wait out the ferocious ebb tide before trying to motor our way through Hells Gate. This is essentially where the North River (the Hudson), the East River and Long Island Sound all come together. It’s a narrow passage where a lot of water flows at speeds up to five knots with the tide. Shawn and I were below on his 27-foot Bristol sail boat just chatting it up when we heard what sounded like a bilge pump engaging automatically. We didn’t have an automatic bilge pump. After cocking our heads at each other trying to sort it out, we popped our heads out of the companionway only to see we were being boarded by the Coast Guard. It turns out we’re not allowed to tie up on this unmarked pier and we ended up with a citation – a boat parking ticket – before our trip began. The really interesting part was the NYPD floated up shortly afterwards (while Shawn was up the mast in the rigging clearing a line) and couldn’t believe we got a citation. The cops gave us some floating key chains and their condolences. Under the silhouette of the Manhattan skyline as the setting sun turned the western sky orange, we cut our lines cranked our motor and hummed our way through the narrow window of slack water into Long Island Sound. We passed right under the final approach to LaGuardia Airport. Eventually, we hoisted our sails and motor-sailed into the night for a few hours before cutting the engine to enjoy the dark quiet. Shawn had had a long day and went below to catch some rest. I bundled up in a sleeping bag in the cockpit and manned the tiller for the dog watch. We had a light puff of air for about half an hour after Shawn went below. But then the dark waters glassed over and we drifted for a few hours. We had already burned through one of our three-gallon gas tanks and most of our second. We wanted to preserve the last bit of fuel for maneuvering within the harbor to pick-up more fuel – if we ever got there. The large waxing gibbous moon rose from the water and was tethered by its long reflection of light in the water right to the boat. I kept a light hand on the tiller, though it probably didn’t matter until a light breath of air – like the gentle blowing of a kiss – graced our sails and we made way as the sky started to lighten. This kiss of wind brought us to the mouth of Stamford Inlet along the Connecticut coast. A man skulled by us for his morning workout over the flat waters. We sailed as close to the inlet as we could and had to tip the fuel tank to drain every last drop to make it into the marina where we could refuel. We were hoping to find somewhere to have breakfast, but our simple snack earlier this morning of bananas, biscuits, peanut butter and jam with a spot of tea would have to do for now. Back in the open waters of Long Island Sound we would alternate between motoring and sailing as the wind allowed. The sun marched up the sky until it was blazing down from directly overhead, then started to sink back towards the horizon where it set the clouds on fire producing one of the most amazing sunsets I have ever seen. In the midst of that, Shawn felt compelled to strip down to his birthday suit and dive into the orange and purple waters reflecting the sky above. Once he was back on board and relatively dried off, we compared our chart to the array of flashing green, red, amber and white lights sparkling in the dark around us to determine our next line of sail towards Fisher Island. Again we were cautious to consider the tide and our limited fuel supply. Once a decision was made, it was my turn to head below and get some sleep. The next morning I woke to find us tied onto a mooring in a small misty bay on the north side of Fisher Island. It turns out Shawn had quite the adventure of his own that night. Something about hailing another vessel to see if they had any extra fuel… then the Coast Guard got involved (again!) and such and such. I didn’t dig for details as all was good now. We pulled off the mooring and motored over to the dock. This is where the story starts to sound like our first trip down the Hudson River back in January. 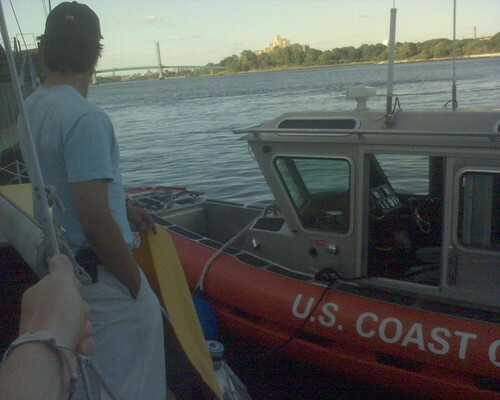 Shawn had to get to work in Newport and I was to single-hand the vessel out of Long Island Sound, up the coast and into Narragansett Bay home to Newport. I didn’t know exactly where to go in Newport and I had never sailed in Narragansett Bay to know my way around. Shawn assured me it would be very obvious and pointed things out on an illustration of a map in the tide book as we didn’t have a proper chart of the bay. Leaving Shawn at the dock to catch the ferry to the mainland and off to work, I motored back out to the ebbing waters of Long Island Sound, now in our favor, to take advantage of the tidal flow. The sky was mostly clear but a light haze lingered. Thinking nothing of it, I concentrated on following the channel markers out of Long Island Sound then sat back to relax, alternating between motoring and sailing as the wind permitted while heading up the coast of Rhode Island. The haze thickened and before I knew it, I was enveloped in a dense fog. The shore, not a quarter mile off my port beam was out of sight and because the compass wasn’t properly calibrated (or even mounted) I used the sun while I could see it, the wind – hoping it wouldn’t shift much – and dead reckoning to continue my course. I favored my steering to the left thinking it would be better to keep track of the shore instead of ending up off the coast of Iceland, or worse, just sailing in circles. I nearly ran aground before I could see the beach. I skimmed my way just off the shore, avoiding the large rock outcroppings and sneaking up on anchored fishing boats. I must have been an eerie sight to those fishermen as I silently materialized out of the fog while under sail, drifted by, then again disappeared into the ubiquitous whiteness, sails and all. Finally, amidst the gentle lapping of the water against the hull a faint low tone drifted across the water and through the fog. This was the fog horn on Point Judith, my landmark to turn into the unknown (and as far as I was concerned, uncharted) waters of Narragansett Bay. I had to strain to decipher the exact direction the sound was coming from, but I did my best to steer towards it. As I got closer, the sound of the fishing boats motoring to and from the nearby inlet was encouraging. Again, my shore following tactic proved worthwhile. I sailed off the last chart I had and I imagined what this would have looked like under bluebird skies. Clear sparkling water, warm sunbeams, wooded shorelines punctuated by a few waterfront properties and Conanicut Island, my primary point of reference to navigate into Newport. Instead I was bundled up and had the same view of white nothingness in all directions. After some time of sailing up the shore, I took a stab in the fog as it were and made the blind plunge away from my steady shoreline and dove into the fog hoping to hit the southern tip of Conanicut Island. Once away, a thin patch of fog allowed me to see the vague outline of a point ahead of me. If everything was as I was believing it to be, then I was right where I wanted to be. It felt good to make that next step but I kept my thought humble by thinking of Shackleton and the boys crossing 800 miles of the open Southern Ocean to hit the skinny end of South Georgia Island. If only I had a sextant (and stars). The fog was starting to darken. On a clear sunny day, there would still be plenty of sunlight, but the fog changes things. I knew I still had a few hours of light, but if I didn’t make it somewhere before dark, I would have to find a way to anchor and wait until the morning. The island had a ragged and rocky shoreline. I suspect it was very deep and dropping an anchor might not have been possible. The sound of a small motorboat caught my ear and attention. I gave two toots with my air horn to hail them and confirm my location. I was right where I thought I was, but Len and Jill who had been out fishing in their decked out, GPS enabled 14-foot Zodiac wouldn’t let me continue to navigate the waters blindly on my own. They strongly discouraged me making the final crossing from Conanicut Island over to Newport and offered to guide me past the protruding rocks to Jamestown where I could get a mooring for the night. I doused my sails and cranked up my motor and was grateful for their patience of my put-putting along. They took me right along the channel markers using a GPS and shortly after I started following them a loud low blast honked from the thick fog. A 40-foot pilot boat came out of the fog and it was dwarfed by the nebulous dark outline of a massive tanker. The fog was so thick, I could only see the bottom of the hull. The rest of the tanker was completely obscured in the fog. I can only imagine what it would have been like if I was trying to cross the channel only to find this vessel bearing right down upon me, totally unaware of me. And me not knowing it was there until it was way too late. Len and Jill organized a mooring for me to tie on to and I called Shawn to come pick me up. As it turns out Len knew the owner of an excellent seafood restaurant right there in Jamestown and the owner took Len and Jill’s fresh catch and served us a scrumptious meal. Darkness fell, the fog remained and I was very happy to have a full belly, be off the boat and on my way to a warm and dry bed for the night. This entry is filed under: North America, Sail, Story, Video, Water.